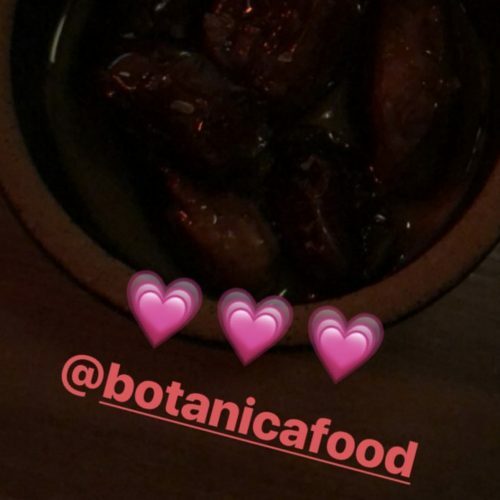 “Dates in olive oil with tahini are ON THE WHOLE 30” is what Busy Philipps reported when she ate here while dieting in November 2017. A Botanica “Brunch and biking” was on Jesse Tyler Ferguson and Justin Mikita‘s agenda in November 2017. Jesse Tyler Ferguson did lunch at Botanica in September 2017. Busy Philipps had a drink at Botanica in June 2017 and said, “From matcha to margarita in under an hour. I’M LIVING MY LIFE.” Later that month, she came back with her best friend to celebrate National Best Friends Day here.